Canon has introduced two new ultra short throw projectors, the LV-WX300UST and LV-WX300USTi (pictured). 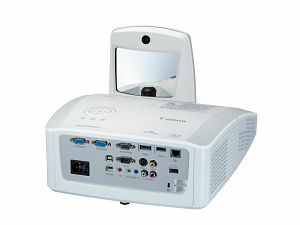 The "i" in LV-WX300USTi stands for "interactive," and the projector is Canon's first model that allows students and teachers to interact with the projected content. The projector ships with two interactive pens that can write on the projected screen. Additional pens can be purchased separately, and the device supports up to four interactive pens writing on the screen simultaneously. Canon also offers an optional Finger Touch Module, which lets users write on the projected screen using a finger, pointer or other object rather than an interactive pen. optional wall mount (sold separately). The LV-WX300UST is available now with a suggested list price of $1,749.99. The LV-WX300USTi will be available in late July 2015 with a suggested list price of $1,799.00.